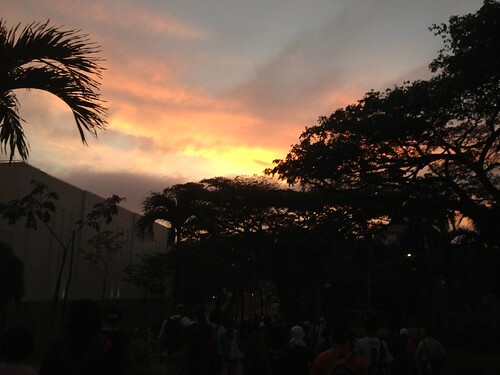 As the sun rose last Sunday, 12th February 2012, more than a hundred people walked from the University Cultural Centre up to the Ridge, and across the Gap past Kent Ridge Park to Bukit Chandu. In doing so, they traced the route of the battle of Pasir Panjang and honoured the exemplary defense of the ridge by soldiers of the The Malay Regiment on 13th and 14th February 1942, who battled against the 18th division of the Japanese Army during World War II. This exercise began more than ten years ago but its origins go back to when I was an NUS undergraduate myself. I was a freshman biology undergraduate in the late 80’s and brought to the ridge by my TA, a botany honours student. I was fascinated as she introduced us to the plants there, for she knew the scientific name of everything! We would go on to explore insect life there in second year ecology, ‘listen’ to bats echolocating in third year zoology, use the ridge as a short cut to Central Library (still only a ten minute stroll), watch birds in both day and night, and be lucky enough to see the occasional snake! It was only after I graduated, in the early 90’s, that I learnt that a battle that been fought in the area! My old ecology professor, D H Murphy tossed me a mild remark one afternoon as we chatted on a bench outside the laboratory. I searched for information everywhere but it was ultimately the shelves of Central Library which revealed a University of Malaya history honours thesis devoted to the Malay Regiment. The 1955 thesis by Dol Ramli chronicled the Battle of Pasir Panjang and was eventually published in a journal as: Ramli, D., 1965. The Malay Regiment, 1933-1942. Journal of the Malaysian Branch of the Royal Asiatic Society, 38(1): 199 – 243. I read the words and was fascinated – and also dismayed that I had known nothing of this tale of valor and determination on a ridge I thought I knew so well. This story simply had to be told! 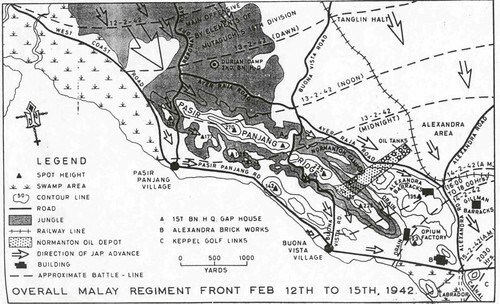 Examining the map in Ramli’s thesis, I realised the battle had begun near the UCC and ended at Bukit Chandu. The thesis told a lovely story of the regiment and we already had our stories about plants and animals, so I initiated the Ridge Walks in 2002. Coincidentally that year, National Archives of Singapore opened the Reflections at Bukit Chandu on the hill. A natural end point for our walks, we began collaborating with them in 2004. Public walks aside, I would eventually lead students up the ridge as part of LSM1103 Biodiversity, a life sciences core module. Three years ago, I decided to extend that walk all the way to Bukit Chandu. This way, our undergraduates flavour their biological impressions of the ridge with a bit of history and geography and early in their NUS career. The building acts as a beacon and this afternoon, I visited Reflections of Bukit Chandu. There I saw primary school kids seated on the floor of the interpretive centre, learning about the Battle of Pasir Panjang. I need no longer worry, this story is being told. I’m blogging on NUS’ facebook account from Feb to May 2012. « Do they remember the 15th of February?